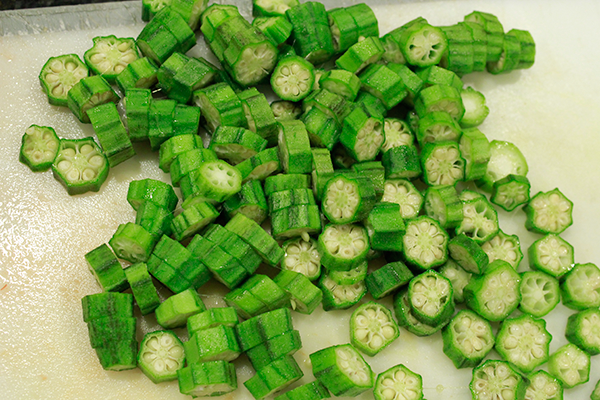 Okra is defining in Gumbo - although a little mucilaginous, its inclusion is not negotiable. 1. Cut chicken into slices and sauté in 1 tablespoon oil with some salt in a large soup pot. 2. Cut sausage into 1 cm triangular wedges and add to chicken and fry another coupla minutes. Drain and set aside. 3. 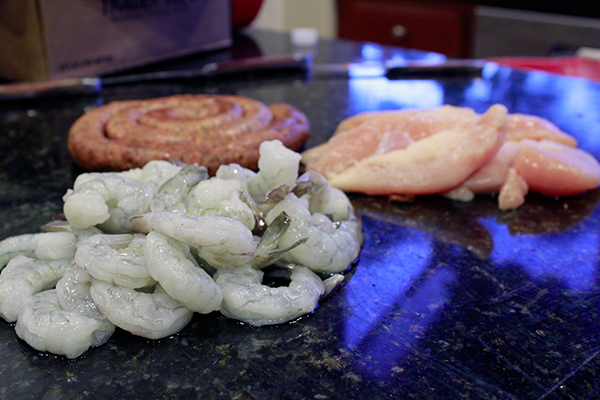 Pour a good splash of the oil into same pan and add sliced and chopped onions. Slice and chop some onions fine and leave some a little coarse. Sauté a few minutes then add the garlic, crushed. Cook a tad longer. 4. Pour white wine into pan. 5. Puree tomatoes roughly then add to onions in the pan. Tip in chicken and sausage. 6. Slice and dice pepper, and celery and add to pot. Add beef bouillon cubes and add water as needed to ensure things can be agitated (but not so much that it becomes soup). 8. 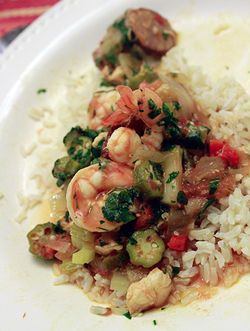 Then introduce your okra (mind, it is a slimy vegetable), the pearl onions and shrimp. Cook for another 5 minutes or so then check seasoning. 9. Add parsley and serve on rice. 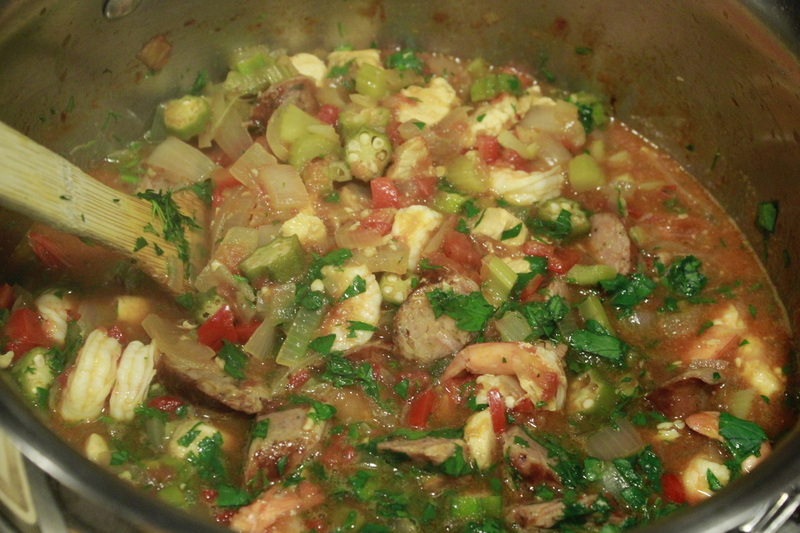 Gumbo has become a traditional football season dish for us - perfect for cold autumn and winter weather. We first made it in 2009, I think, inspired when the New Orleans Saints were in (and then won) the Super Bowl. 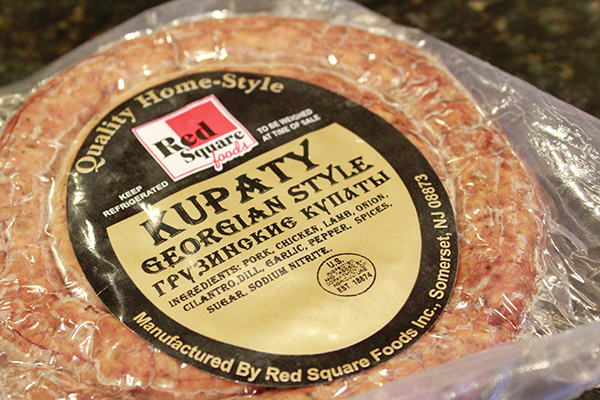 I prefer this sausage with three meats: pork, chicken and lamb. "Okra", in the original Bantu, is "kingombo" - giving the dish its name.